For more than a century, the 6-million-acre Adirondack Park has been an internationally recognized model for wildlife and land conservation. Shingle Shanty Preserve and Research Station (SSPRS) embodies the spirit that has guided the park’s evolution. In private hands for more than a century and protected by a conservation easement that prohibits development, the preserve contains one of the largest boreal peatlands in northeastern United States and the second-largest wetlands complex in the Adirondacks. Moose, marten, boreal birds and scores of other organisms call Shingle Shanty home—and it can be home to your research as well. If you are interested in conducting research at SSPRS, please contact Steve Langdon at director@shingleshanty.org. For the seventh year SSPRS completed the 38, ten-minute bird observation point counts across the peatland complex at Shingle Shanty and a number of additional historic survey locations established by NYSDEC and SUNY ESF. This long-term monitoring boreal bird species is a top priority for SSPRS and has been leveraged to obtain additional contractual work. This work was funded by SSPRS and by NYS DEC Wildlife who contracted directly with Steve Langdon to complete boreal bird surveys at SSPRS and other locations. SSPRS worked with the Wildlife Conservation Society’s Adirondack Program on a project titled ‘Climate change impacts on bird communities in the Adirondacks and neighboring boreal ecosystems’. 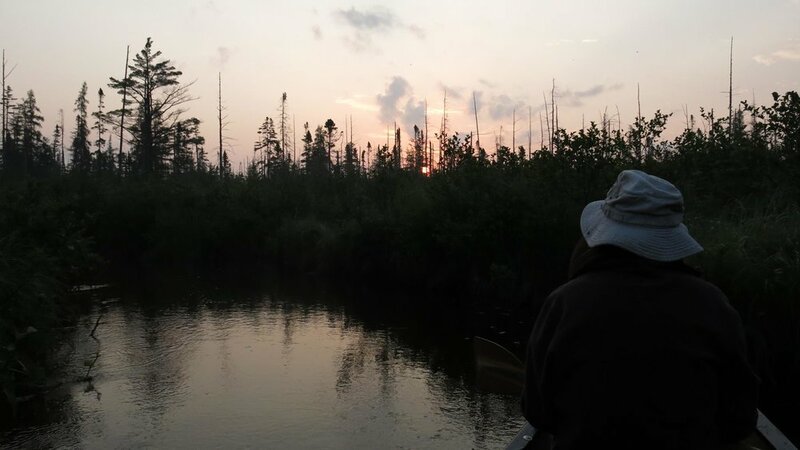 This collaboration with the WCS’s Dr. Michale Glennon utilizes the years of habitat data, and long-term bird and temperature monitoring data collected at Shingle Shanty to understand changes lowland boreal bird communities. The work was funded by the USGS Northeast Climate Science Center and involves collaborators across the northern forest region. A report was submitted to the coordinator of the Project (Dr. Molly Cross, WCS, Boseman, MT) and is under review. Two peer-review manuscript from this work are currently in preparation in which SSPRS Director Steve Langdon is a co-author. Dr. Kurt Smemo of Skidmore College is in his second year of a two-year project with undergraduate students examining tree mycorrhizal associations and their controls on carbon sequestration. The project, titled “Tree mycorrhizal associations control a broad suite of important ecosystem processes: a collaborative study of ADK forest types,” is a collaborative effort between Dr. Smemo and researchers from Ohio, Pennsylvania, and Florida. Bryologist Dr. Sean Robinson of SUNY Oneonta and Steve Langdon conducted vegetation surveys in a number of smaller peatlands on the property, including a poor fen off of Punky Pond Road. The specimens collected and lists of vascular plant species adds to our biodiversity inventory of the property. Dr. Robinson is a co-principal investigator in the National Science Foundation Field Station and Marine Laboratory grant proposal that SSPRS is re-submitting in January 2019. SSPRS is collaborating with Wildlife Conservation Society’s Adirondack Program on a project studying the impact of climate change on boreal bird communities titled “Climate Change Impacts on Bird Communities in the Adirondacks and Neighboring Boreal Ecosystems.” This project utilizes the years of habitat, long-term bird and temperature monitoring data collected by SSPRS in order to understand changes lowland boreal bird communities. The work is funded by the USGS Northeast Climate Science Center and involves collaborators across the northern forest region. For the sixth year, SSPRS completed 38, ten-minute bird observation point counts across the peatland complex at the Preserve. This long-term monitoring boreal bird species is a top priority for SSPRS and is being used to study the impact of climate change. Dr. Kurt Smemo of Skidmore College began using SSPRS as a study site in a two-year project with undergraduate students examining tree mycorrhizal associations and their controls on carbon sequestration. The project, titled “Tree mycorrhizal associations control a broad suite of important ecosystem processes: a collaborative study of ADK forest types,” is a collaborative effort between Dr. Smemo researchers from Ohio and Pennsylvania. In September 2017 SSPRS hosted moss scientists (i.e., bryologists) from across North America as part of the Andrews Bryological Foray. 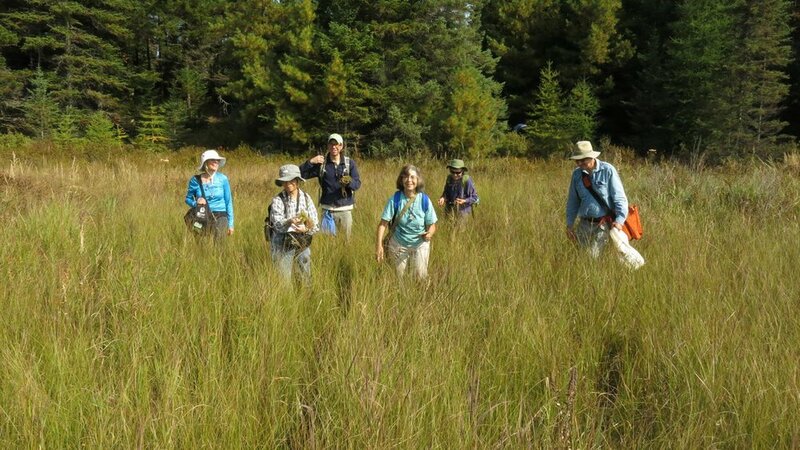 This group of professional and amateur bryologists identified numerous species of mosses and liverworts including a species of Sphagnum moss – Sphagnum balticum – which is true boreal species and known from only three locations in the continental United States (http://explorer.natureserve.org/servlet/NatureServe?searchName=Sphagnum+balticum). We are currently working to confirm the identity of this species with followup surveys in 2018. Moose Calving Surveys. In the winter of 2015-2016 New York State Department of Environmental Conservation put GPS/radio collars on a number of moose across the Adirondacks including moose at SSPRS. SSPRS supported this effort by providing access to NYSDEC and accompanying researchers on moose calving surveys. Moose Habitat/Forage Survey. SSPRS provided access and expertise to researchers from the SUNY College of Environmental Science and Forestry studying what moose eat. Researchers used GPS locations from collared moose to identify locations on SSPRS where moose were staying and then quantified the level browse at these sites. 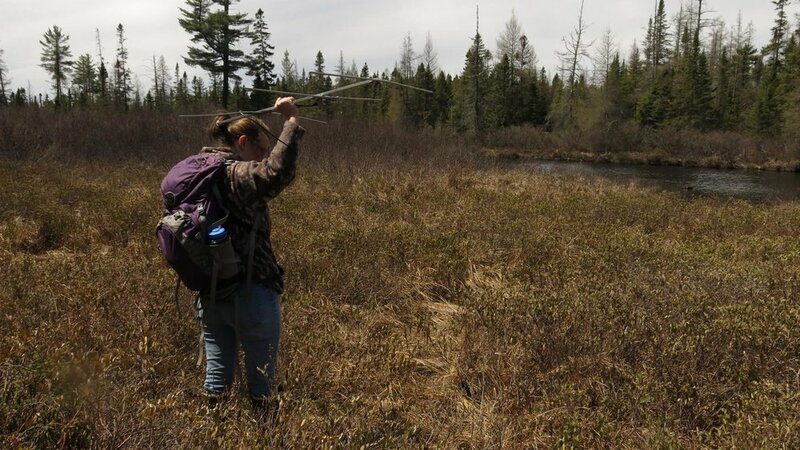 A wildlife technician from the NEw York State Department of environmental Conservation uses radio telemetry equipment in a moose calving survey in 2016. Boreal Bird Monitoring at SSPRS. This was our fifth year of completing 38, 10-minute bird observation point counts across the peatland complex at the Preserve. This work was funded by SSPRS and a grant from the Northern New York Audubon Society. Steve Langdon and Tom Lecky visited the 38 long-term monitoring locations that were established in 2011 and did 10-minute surveys for boreal birds. SSPRS conducted annual boreal bird surveys with Tom Leckey, a field ornithologist from Pennsylvania. Despite the week being cut short by heavy rain and vehicle issues 45 species of birds in 28 out of 38 plots were observed. The highlight was a Rusty Blackbird. Angelena Ross and her crew from the New York State Department of Environmental Conservation Region 6 Division of Wildlife returned to the Preserve in 2015 to re-survey for Spruce Grouse and conduct boreal bird counts at additional sites. Angie had been surveying for Spruce Grouse for nine consecutive years at Shingle Shanty and other sites across the Northern Adirondacks. With colleagues at the SUNY College of Environmental Science and Forestry and the SUNY College at Potsdam, she published Spruce grouse decline in maturing lowland boreal forests of New York in the Journal of Forest Ecology and Management, in which she acknowledges Shingle Shanty’s contribution to her work. Thanks to a 2014 grant from Northern New York Audubon, SSPRS completed the last boreal bird habitat surveys in August 2015. These data are being used to better understand the relationship of the boreal birds at Shingle Shanty and their habitat preferences. In October 2015, Project Manager Steve Langdon submitted a manuscript co-authored by Dr. Martin Dovciak and Dr. Donald Leopold at the SUNY College of Environmental Science and Forestry, to the journal Botany. This work reflects a 4 year effort to document the main drivers of the distribution of vegetation in large boreal peatland complexes at their southern range limit. If accepted, the manuscript will be the first peer reviewed study of the vegetation of a large boreal peatland in our region. In 2014 the longest period for the entire year without a frost was only 19 days in two of the open bogs on the preserve. cold temperatures and Frequent frosts are important for maintaining the unique vegetation in Adirondack lowland boreal habitat. New York State DEC Region 5 Division of Wildlife personnel toured the property in late February 2014 to assess the suitability of SSPRS for implementation of a moose population and habitat selection study. They concluded at the time that the site was excellent but that it would be too difficult for them logistically to work at SSPRS. SSPRS raised $3,000 through a grant from the Northern New York Audubon Cullman Foundation Grant, the Adirondack Gives website, and a private donor to continue boreal bird surveys and to expand this effort to include a habitat assessment component. The habitat assessment is an expansion of the work done in 2011 and 2012 with the purpose of characterizing the vegetation structure of peatland complex. With the money raised SSPRS hired two field technicians: Tom Lecky - to survey birds for week in June with the Project Manager; and Stephanie Sears to survey bird habitat in August with the Project Manager. June bird surveys resulted in the completion of 40 point counts over 5 days. August habitat surveys resulted in 10 habitat assessment plots over 6 days. SSPRS spent a little more than half of the money raised for habitat surveys and will continue with this effort in 2015. 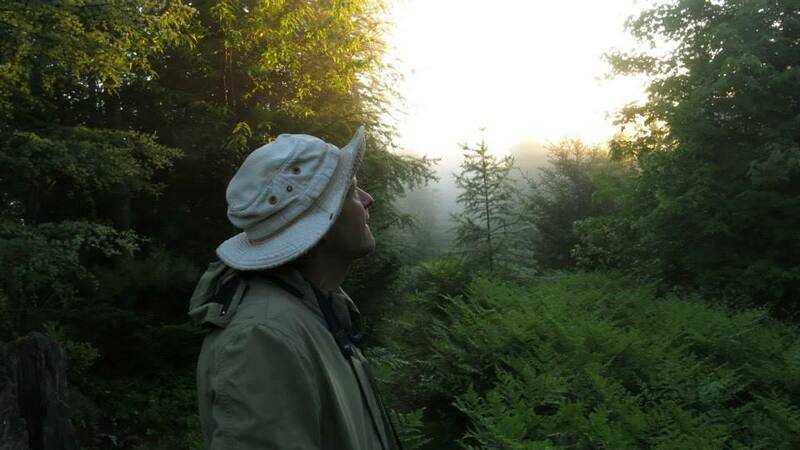 Field Ornithologist tom leckey on a frosty morning in late june. NYS DEC Region 6 Division of Wildlife personnel did point count surveys for boreal birds and Spruce Grouse playback surveys during the same week as our boreal bird point counts were taking place. This cooperative effort has expanded our bird data and has allowed DEC to assess the suitability of the GLSA peatland complex for Spruce Grouse re-introduction. Sam Beguin setting up one of his bio-acoustical monitoring devices for his thesis research. researchers from the USGS Patuxent Wildlife Research Center sampling bees. Sarah Glancy, a graduate student at Plattsburgh State University is researching the differences of zooplankton communities between fishless and stocked, or fish-inhabited lakes across the Adirondacks. She was particularly interested in SSPRS and Brandreth because of the remoteness and watershed position of the lakes. Ms. Glancy sampled zooplankton in Thayer Lake, Shingle Shanty Pond, South Pond, East Pond, and North Pond. All equipment was sterilized prior to coming to SSPRS and between each sampled lake. Little is known about zooplankton diversity in Adirondack Lakes. 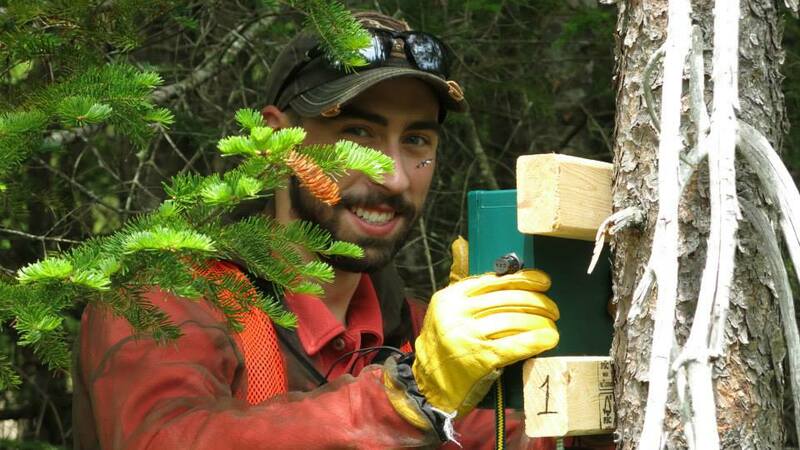 Shinlge Shanty Director Steve Langdon completed his MS Thesis titled 'Vegetation Composition and Structure of a Large Boreal Peatland Complex in the Adirondacks of New York State' (https://search.proquest.com/openview/2c4e904c5391a725abe6feacca22cc1a/1?pq-origsite=gscholar&cbl=18750&diss=y). There few reports of vegetation structure and composition of large boreal peatland complexes in New York State, the southern extent of their geographic range, making this an important contribution to regional wetland ecology. A manuscript based on this thesis is in review. Quantifying trends in mitogenomic diversity, population structure and demography among small mammals of the Adirondack region over the last century. Nicholas Mason, PhD Candidate, Department of Ecology and Evolutionary Biology, Cornell University. Personnel: Nicholas Fletcher , PhD Candidate Department of Ecology and Evolutionary Biology, Cornell University; Kimberly Bostwick, PhD. Curator of Birds and Mammals, Cornell University Museum of Vertibrates. Mary-Margaret Ferraro; Jennifer Campbell-Smith, Field Staff. Small mammals form an important component of boreal forest ecological communities, such as those found in the Adirondack Mountains. In addition to imposing top down effects on invertebrate populations, small mammals are an important prey item for many carnivores and also promote the dispersal of seeds and vegetative propagules. Thus, the long-term stability of small mammals may be tightly tied to the stability of the Adirondack ecosystem as a whole. Here, I propose a study to assess long-term trends in the genetic diversity, population size and phylogenetic structure of small mammals in the Adirondacks. Through the use of hybridization capture protocol for DNA, a cost efficient and effective pipeline will be employed to gather entire mitochondrial genomes from both historic and extant populations of small mammals. Recordings of birds made during this research are archived at the Cornell Lab of Ornithology's Macauly Library (https://macaulaylibrary.org/asset/163300). REsearchers from the Cornell university department of ecology and Evolutionary biology testing recording equipment at Shingle Shanty in 2013. Photo courtesy of Nick Mason. Stephen Langdon, Director, SSPRS; Tom Leckey, Field Ornithologist; NYSDEC Region 6 Division of Wildlife Field Staff. SSPRS repeated all of the survey points established in 2011 and those that were established by the Wildlife Conservation Society in previous years. This work contributes to a broader database of boreal bird surveys across the Adirondack Park that has been on-going since early 2000s. New York State Department of Environmental Conservation Division of Wildlife has taken over the responsibility of overseeing the region-wide project. This year SSPRS worked with NYSDEC field staff to re-survey additional points that were not surveyed since Shingle Shanty Preserve and Research Station’s stewardship tenure, adding an additional 16 points to our data. Sunrise in the boreal peatlands during the 2013 bird surveys. A total of 64 species of birds in 54 plots were observed during the observation period and an additional 9 species were observed outside of the observation period. Notable observations include auditory observations of Rusty Blackbirds in 4 separate plots and visual observations of 5 individuals at those sites during the survey period. Additionally NYSDEC field staff observed a Rusty Blackbird out of the survey period at a site north of the Hawk’s Nest road. We also observed a Blackpoll Warbler displaying territorial nesting behavior at a site in the peatland near the intersection of the Hawk’s Nest road and the Railroad grade. This observation was made outside of the observation period but is noteworthy because this species normally nests above 3000 feet elevation in the Adirondacks. Angelena Ross, Endangered Species Biologist, New York State Department of Environmental Conservation, Division of Fish and Wildlife, Potsdam NY. This was the 5th Spruce Grouse specific survey to take place in the larger boreal bog at Shingle Shanty. No sign of Spruce grouse was found. Stephen Langdon, SSPRS. The large and small bogs in Glacial Lake St. Agnes at Shingle Shanty Preserve and Research Station are demonstration sites for a project to develop a monitoring protocol to detect wetland response to climate change in the Adirondack Park. This work consists of and mapping, intensive vegetation assessment, phenological assessment, and monitoring weather data at sites across the Adirondacks. Shingle Shanty’s contribution to this work includes deployment of our data logging temperature sensors at demonstration sites across the Adirondacks as a trial for the implementation phase of the project that begins in 2014. Researchers from SUNY College of Environmental Science and Forestry and the New York Natural Heritage Program spent 2 days in June intensively sampling vegetation at these sites. Jerry Jenkins, Northern Forest Atlas Project. The Northern Forest Atlas Project is an effort to document flora, fauna and ecology of the northern forest region. Jerry Jenkins camped at Thayer Lake and set up macro-photography and computer equipment to photograph and develop images of mosses and plants in the area. This is a long term project that will receive continuing logistical support from SSPRS. Ezra Schwartzberg and Stephen Langdon. 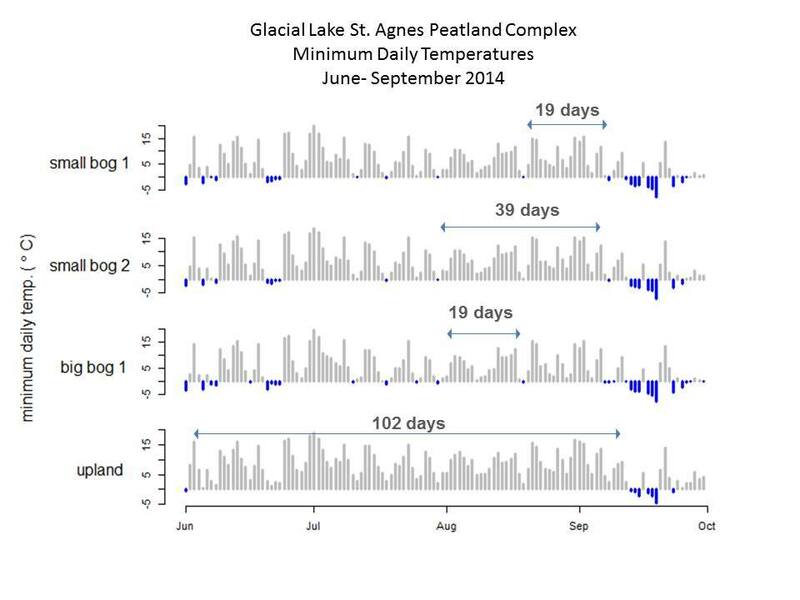 SSPRS lent data logging temperature sensors to Intervale Lowlands, a 150 acre preserve in Lake Placid NY, in order to gauge micro-site temperature heterogeneity at this site. Four data loggers were deployed across the property for 2 months from December 2012- January 2013. Partnering with other conservation/research organizations across the region furthers the mission of SSPRS. Jeremy J. Kirchman, Curator of Ornithology, New York State Museum: Joel Ralston, Visiting Assistant Professor of Biology, Utica College; Alyssa FitzGerald, PhD Student at Univ. of Albany; Kyle Ford, Senior Biology Major at Utica College, Undergraduate field assistant. Geographic distributions of species are shaped in part by species’ ecological niches, and reflect evolved habitat preferences and tolerance of climate conditions. In the face of ongoing global climate warming, species are predicted to shift their ranges poleward or up in elevation as they track suitable conditions, and diverse data sets indicate that several high-latitude and high-elevation species have already shifted their ranges. Populations of boreal forest birds in northern NY may disappear from the state in the current century due to these climate driven changes in distribution. Growing evidence suggests individual species may respond differently to changing conditions in accordance with specific niche requirements and environmental tolerances. However, it is not known whether high-elevation spruce-fir forest specialists will respond differently than low-elevation spruce-tamarack bog specialists. It is also unclear whether migratory bird species, which are expected to be more genetically uniform across their range due to higher gene flow, will cope with climate change better than sedentary species. Local-scale niche and gene-pool differences such as these may be important factors in species-level responses to climate change. This research examines the ways that niche breadth and genetic diversity are expected to affect the response to climate change in isolated bird populations at the southern periphery of the North American boreal forest biome. A researcher from SUNY Albany collects a DNA sample for research into boreal bird populations. These data contributed to the identification of a hybrid species described in "A new wood warbler hybrid (Oreothlypis celata x O. ruficapilla) from the Adirondack mountains, New York." Angelena Ross, Endangered Species Biologist, New York State Department of Environmental Conservation, Division of Fish and Wildlife, Potsdam NY; John Ozard, New York State Department of Environmental Conservation, Division of Fish and Wildlife, Albany NY. This was the 4th Spruce Grouse specific survey to take place in the larger boreal bog at Shingle Shanty. No sign of Spruce grouse was found. Distribution of vegetation along gradients of light and microtopography in a wind disturbed forested peatland complex in the Adirondacks of New York State, Year 2. Stephen Langdon. Field staff: Jillian Post, field botanist, Ausable Forks, NY; Raymond Curran, Consultant; Stephanie Sears, Field Assistant. Lowland boreal ecological communities in peatlands are nearing their southern extent in the Adirondacks and are thought to vulnerable to the effects of climate change. The purpose of this work is to assess the distribution of plants along gradients of microtopography, light intensity and forest structure in order to better understand successional pathways in this community following disturbances. Field work was completed for this project in September 2012. Stephen Langdon. Field staff: Jillian Post, field botanist, Ausable Forks, NY; Raymond Curran, Consultant; Stephanie Sears, Field Assistant. Township 40, Pigeon Lake Wilderness Area, Long Lake, NY, is widely known as one of the last and largest extents of old growth spruce-northern hardwood forests in New York State. A comprehensive survey of this property was conducted in 1899, lead by Gifford Pinchot with the purpose of convincing the New York State Legislature that scientific forestry could be sustainably implemented on Forest Preserve Land. Pinchot’s efforts to open this area to logging failed but the work resulted in a quantitative snapshot of forest composition a century ago. We conducted a preliminary timber inventory of this property in order to compare state of the 19th century forest with today. This work combined with the work of Jenkins’ (2009) offers a significant data for this comparison. We hope use this preliminary work as leverage for funding future comparisons of managed and unmanaged Adirondack forested ecosystems. Variable radius point counts and measurements of tree diameters were done at 39 systematically sampled points. There was no marking of sites or trees and nothing was left at the survey points. Do Unharvested Adirondack Forests Contain Forest Interior Plants? Jerry Jenkins, Wildlife Conservation Society. This was a follow up to Jerry Jenkins’ Fall 2009 survey of understory vegetation of upland northern hardwood forests at the Preserve. We revisited a number of plots to see if there were a significant number of spring ephemerals that were not accounted for in the earlier survey which took place in September. No report is expected from this work. Distribution of vegetation along gradients of light and microtopography in a wind disturbed forested peatland complex in the Adirondacks of New York State. Stephen Langdon, SSPRS. Lowland boreal ecological communities in peatlands are nearing their southern extent in the Adirondacks and are thought to vulnerable to the effects of climate change. The purpose of this work is to assess the distribution of plants along gradients of microtopography, light intensity and forest structure in order to better understand successional pathways in this community following wind disturbance. Stephen Langdon, Brian MacAllister, Center for Adirondack Birding, Paul Smiths College Visitors Interpretive Center. Shingle Shanty Preserve conducted a week long presence/absence survey of bird species in the extensive lowland boreal habitat along Shingle Shanty Brook. Funding from the Northern New York Audubon Society allowed us to hire an experience field ornithologist. We used methods established by the Wildlife Conservation Society’s Adirondack Communities and Conservation Program. Shannon Buckley M.S. Student, SUNY College of Environmental Science and Forestry. Additional Personnel: Stacy McNulty, Research Associate; Caitlin Snyder, MS Student. The Rusty Blackbird (Euphagus carolinus) has experienced the most dramatic decline of any North American bird species in the last century. “Rusties” breed in boreal wetlands across North America, extending from the Northeastern US, across Canada and into Alaska. Researchers from New York, Vermont, New Hampshire and Maine are collaborating in an effort to understand habitat requirements and the role of timber harvesting in habitat selection and nest success across the Northeast. Study areas include the Adirondack Park, the White Mountains of New Hampshire, and the Moosehead Lake region of Maine. Data on breeding demographics and habitat selection are being obtained through a variety of on-the-ground and remote methods including monitoring nests with motion-triggered cameras, radio telemetry, vegetation measurements and GIS analysis. Comparison of Carbon and Nitrogen isotopes in extant and fossil plant and animal tissue. Dr. Robert Feranec, Curator of pleistocene vertebrate paleontology, New York State Museum. I am a paleontologist that examines chemicals, called stable isotopes, in fossil bones and teeth to determine where ancient animals lived and what they ate. By examining these chemicals in the same species over time, I can tell when and if diet or habitat use has changed, and if, for example, the change is related to something like climate change. To understand the results I get from fossils, I use modern ecosystems as a model. At Shingle Shanty, I will make a comparison of the stable carbon and nitrogen isotopes in a selection of plants, as well as in the stomach contents, hair, bone collagen, and tooth enamel of a number of different mammal species including white-tailed deer, porcupine and hare. These results from Shingle Shanty will show me how these chemicals (i.e., stable carbon and nitrogen isotopes) move from the plants into the animal's tissues. I will then use this information to better understand the results I get from the bones and teeth of ancient animals. 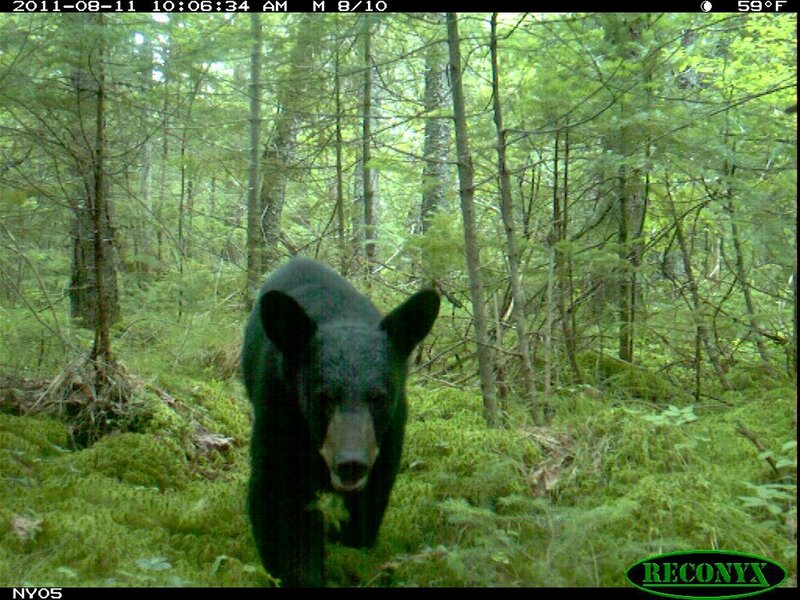 Trail camera image from the 2011 New york state museum research. Jeremy Kirchman, Curator of Ornithology, New York State Museum. Ornithology research at New York State Museum examines the ways that geography, climate change, and genetic diversity affect the evolution and extinction of bird populations. We focus on cold-adapted species with “arctic-alpine” distributions in the boreal forest biome of North America. The boreal forest, covering 14.5% of Earth's land surface, reaches its southern periphery at 50° - 60°N latitude but occurs as far south as 40°N at high elevations. The ranges of arctic-alpine species undergo elevational and latitudinal shifts in response to fluctuating climates, resulting in cycles of isolation and remixing of peripheral populations that have important implications for the formation of new species and the loss of genetically unique populations. We use the tools of molecular genetics to address questions such as: Are disjunct populations at range peripheries evolving independently of one another? How do dispersal and migratory behaviors affect geographic patterns of genetic diversity? How much genetic diversity will be lost in the coming decades given alternative climate warming scenarios? Dr. David Patrick, Adirondack Biodiversity Institute, Paul Smith’s College. Stacy McNulty, Adirondack Ecological Center, State University of New York College of Environmental Science and Forestry, Newcomb, New York. Maegan Spindler. Kathleen Atwell. The purpose of this research is to develop monitoring protocols for northern forests that take into account changing forest management needs. These needs include changes in land-ownership structures, concerns for biodiversity, effects of climate change and the need for bio-fuel production as well as the traditional needs of the forestry industry. These trial monitoring protocols are adapted from U.S. Forest Service and National Park Service methods. Shingle Shanty Preserve and Research Station offers a diversity of Northern Hardwood Forests that fit well with the needs of this research. Preliminary Results: In 2009 and 2010, over 60 forest inventory plots were established to examine woody and non-woody plants and herptiles. Breeding Ecology and Population Dynamics of the Rusty Blackbird (Euphagus carolinus) in the Adirondack Park. Dr. Michale Glennon. Wildlife Conservation Society’s Adirondack Communities and Conservation Program. Field Staff: Melanie McCormack. The Adirondacks is the southern-most extent of many habitats that support boreal bird species. As part of the Wildlife Conservation Society’s Adirondack Living Landscapes Program this research tries to map the abundance and distribution of the Rusty Blackbirds (Euphagus carolinus) and other boreal birds in the Adirondacks. This information is to be used as baseline data for understanding the effects of global climate change and to help with long term conservation planning. The principal investigator is Dr. Michale Glennon (WCS) and the supporting investigator is Melanie McCormack (Master of Science candidate, Green Mountain College).Shingle Shanty Preserve and Research Station’s offers extensive boreal wetland habitat that is known to support species included in WCS’s boreal bird research. Richard Ring, Botanist, New York Natural Heritage Program. New York Natural Heritage Program’s boreal bird/community field work collects data addressing a variety of needs. These include both inventories of rare species and investigations of associations between boreal birds and vegetation, communities, and landscape-level habitats. 30 point counts were done in various boreal wetland communities. The following boreal birds were included in the point counts: Alder Flycatcher, Blackpoll Warbler, Blue Jay, Blue-headed Vireo, Boreal Chickadee, Brown Creeper, Cedar Waxwing, Common Loon, Common Yellowthroat, Golden-crowned Kinglet, Gray Jay, Hairy Woodpecker, Hermit Thrush, Lincoln's Sparrow, Magnolia Warbler, Nashville Warbler, Northern Flicker, Northern Parula Warbler, Northern Waterthrush, Palm Warbler (Yellow), Purple Finch, Red-Breasted Nuthatch, Red-eyed Vireo, Scarlet Tanager, Slate-colored Junco, White-throated sparrow, Winter Wren, Yellow-bellied Sapsucker, Yellow-breasted Flycatcher, Yellow-rumped Warbler. Mayflies (Ephemeroptera) Stoneflies (Plecoptera) and Caddisflies (Trichoptera) of the Upper Hudson, Lake Champlain, and Northeastern Lake Ontario Watersheds (New York State): A Baseline Inventory with Management Considerations of SGCN and other Rare and Possibly Imperiled Species. Dr. Timothy Mihuc, Lake Champlain Research Institute, State University of New York at Plattsburgh. The purpose of this project is to inventory the aquatic insect orders Ephemeroptera, Plecoptera and Trichoptera in Northeastern New York State. The principal investigator is Dr. Timothy Mihuc of the Lake Champlain Research Institute at Plattsburgh State University. Supporting investigators are Luke Meyers (M.S., Colorado State University) Lake Champlain Research Institute and Dr. Boris Kondratieff (Colorado State University). It is funded by the New York State Department of Environmental Conservation State Wildlife Grant program. Results: A list of species of Ephemeroptera, Plecoptera and Trichoptera has been prepared for Shingle Shanty Preserve and Research Station. This included 126 species, 7 of which are new records for the state, an undescribed species of Plecoptera and a globally endangered species of Trichoptera. Are Forest-interior Floras Poorer in Managed Forests? Jerry Jenkins, Wildlife Conservation Society Adirondack Program, 7 Brandy Brook Ave., Suite 204. Saranac Lake, NY 12983. Charles Canham, Institute for Ecosystem Science, Box AB, Millbrook, NY 12545. The purpose of this research is to better understand potential difference in floral diversity in old- growth, commercial and post-commercial northern hardwood forests. Vascular plants and bryophytes are studied. This work is important to developing forest management practices that maximize biodiversity. Shingle Shanty Preserve and Research Station offers a diversity of managed forests that are well suited to the parameters of this research. Jenkins, J. (2010). Do unharvested forests contain forest interior plants? A final technical report for the Northeast States Research Consortium. Unpublished. Wildlife Conservation Society Adirondack Program.